Note to the kosher crowd: Sheila is a seafood restaurant but the dish could be replicated at home without the shellfish and be completely kosher. As many of you know, Sheila is one of my favorite restaurants in Israel. If you haven't caught the article at The Washington Post, you can read it here. In addition to the recipes that appeared in The Washington Post, I was fortunate enough that Sharon, Chef Cohen that is, shared with me, one of my all time favorite restaurant dishes, his green risotto recipe. Here, I am happy to share it with you. It's absolutely phenomenal. Blanch asparagus and beans in boiling water for two minutes and remove to an ice bath. In a wide pot with a heavy base, melt the butter on medium heat and sauté onions until soft but do not caramelize onions and butter. Add the sliced garlic and sage leaves and continue sweating for a couple more minutes. Add the rice and mix with a wooden spoon until rice is translucent. Make sure the rice does not caramelize and get crispy. Add a cup of wine while constantly mixing. When the wine reduces, add gradually the stock while mixing and reduce. Cook the rice at all times on medium and make sure there is always liquid in it bubbling on a gentle bubble. 2-3 minutes before the risotto is done, add the calamari and mussels. 1 minute before the risotto is done, cover the pot with a lid to allow the mussels to open. Keep covered for a minute, take lid off, make sure all mussels are open and then add the mascarpone, basil/spinach puree, asparagus and beans and mix. Take off the heat, add lemon and parmesan and mix. The green risotto popping into the mussels looks beautiful. Taste and adjust for salt. Coat the fish fillet well with salt, pepper and a few thyme leaves. Heat up a heavy frying pan, melt the butter and warm up butter on high heat until it turns golden. Add the fish fillets skin side down and sear for 20 seconds until golden on high heat. Turn down heat to low and continue cooking skin side down for another minute. Turn fish to flesh side down and sear on high heat for 20 seconds until golden. Remove from pan into a plate. If fish isn’t cooked through put in a preheated 400F oven for 2-4 minutes. Note: The basil/spinach puree, blanching the asparagus and beans and cooking the fish fillet can be done while the risotto is cooking. The total cooking time is 30 minutes if working simultaneously on different components of the dish. In four separate plates, scoop the seafood risotto evenly. Place a fish fillet on the risotto and serve. *Fish stock can be made in advance by adding fish bones, heads and tails to boiling water with celery, carrots, onions, garlic, thyme. parsley and salt. Sharon of Sheila Restaurant also adds some grated tomatoes to the stock. Sharon’s tip: do not cook the stock longer than 40 minutes. You could also find excellent ready-made fish stock in your market aisles. TY Rosa. It is really something. Oh you have me drooling with this dish. Love it! my lunch time :) yumm!! Adoring this dish - Fish and risotto . divine Shulie and thanks for sharing! Thx Meeta. Was really sensational. TY Lora, it was, freshly caught that morning, unbelievably fresh. That's one elegant looking dish! I love the addition of spinach risotto! Yum! What a gorgeous plating and the food looks so appetizing!! I love your pan too. :) We eat fish quite often, but never had it with basil spinach risotto. It looks very beautiful and it's perfect dish for small dinner get together. I like this type of dishes, they're two in one. 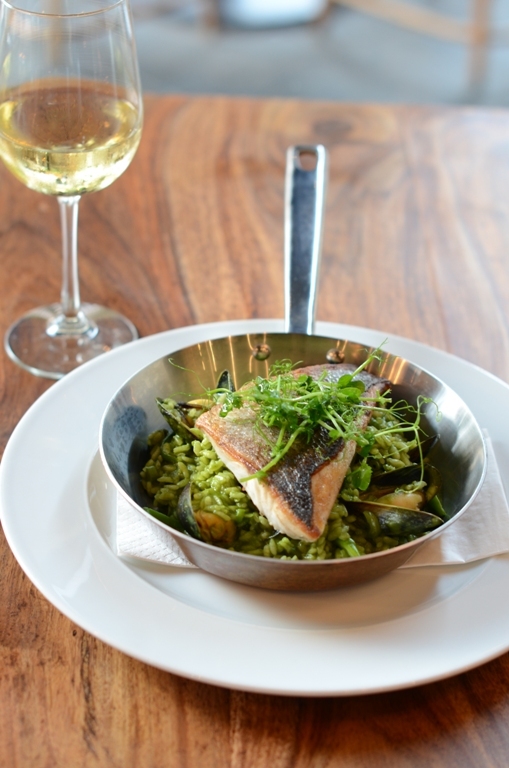 The fish stand alone and so does the risotto, but when these flavors are combined, you get a new wonderful flavor. The dish looks really good, and the way the fish was cooked didn't takeaway it's shape nor look. Amazing! Beautiful dish Shulie. I've never heard of Drum Fish, I need to check that out for sure. That risotto sounds amazing. I can't wait to get in the kitchen and try it. Beautiful plate of food! This is a beauty. And I have just enough basil hanging on to do this! I don't like the buttery mantecato, but mascarpone could make a good substitute. Has to be tried. You made me drool here and I am loving the idea of spinach risotto! Gorgeous risotto, I love the basil and spinach! that looks so mouth watering, I wouldn't mind a bite right now. I dont really make nice risottos, just havent got the hang for it yet and my husband is't that much of a fan for this type of rice dish. I want to get better at making it though, so I ll make yours once when my husband isn't coming home for dinner. Hello there, You've done a fantastic job. I will certainly digg it and personally recommend to my friends. I am sure they'll be benefited from this website. Thanks , I've recently been looking for information about this topic for a while and yours is the best I have came upon so far. But, what in regards to the conclusion? Are you certain in regards to the supply? The clarity in your post is just nice and i could assume you're an expert on this subject. Well with your permission let me to grab your feed to keep updated with forthcoming post. Thanks a million and please carry on the enjoyable work. time to be happy. I've read this post and if I could I wish to suggest you few interesting things or suggestions. Maybe you can write next articles referring to this article. I want to read more things about it!